23rd October was a special day for the culture and tradition of Bikaner, The recital of Urdu Ramayan infused amazing freshness and revitalised the age old traditions, love and respect for our past and commitment to the eternal values of simplicity and spirituality. As Mr. Sunil Rampuria and Asad Ali were reciting the amazing sonets of Urdu Ramayan, I was wondering about what has gone wrong with the present so called development. After independence, some people have tried their best to deprive India of its traditions and heritage, but they have failed. Hindustan still lives its amazing rich traditions and culture. Bharat still loves its heritage. It is a tragedy that the students are not taught about the rich Indian traditions and culture in their schools. It is a shame that if some one tries to insert Gita in school text books, he is termed as an orthodox and narrow minded person. A student who has studied in typical public school would not understand anything about rich Indian heritage. However, the real Bharat, which still lives in villages, tries to preserve the amazing traditions and culture and continues the age old practices. 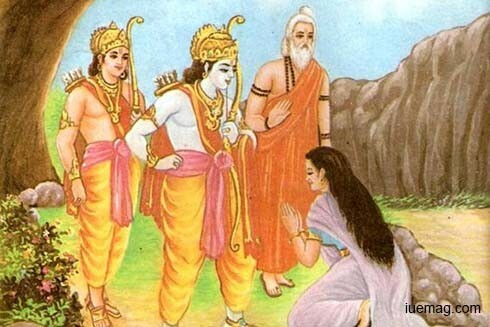 Every home is a pathshala (a school) and these days every home is narrating the story of Sita and Ram to children. The characters of Sita and Ram are played by children and they visualise the great Indian heritage. Indians have migrated to 218 countries and they have taken the amazing Indian culture with them. Ramayan is discussed in all these countries these days. Fortunately, Bikaner is still not much affected by the metro culture or the so called developed practices (which rather deprives people of their rich heritage). Bikaner still celebrates the age old practices and rituals. People mingle together to celebrate festivals and recount stories on Ram and Krishna on different occasions. Children get the stories of age old Indian epics from their surroundings. This is also the city where Urdu Ramayan was written in 1935 by Hussain Khan Rana Lukhnavi. So what? Every year hundreds of books are written, how does it make any difference? Urdu Ramayan is still read out and people discuss the character of Ram and Sita during these days. Asad Ali and Zia Ul Hasan Kadri have been continuing this tradition since 2012. Thus the Urdu Ramayan is part of culture of Bikaner. On 23rd October, a new chapter was added to this rich tradition. Sunil Rampuria learned Urdu and read out Urdu Ramayan written in Urdu script. The occasion was 236th conference organised by Paryatan Lekhak Sangh and Mehfile Adab. People were overwhelmed to listen the urdu poem (Urdu Ramayan) from Mr. Rampuria. Over 4.5 years ago Mr. U.C. Kochar had started Sunday Conference series, wherein young poets would come and speak out some poetry. Mr. Kochar passed away only after continuing 108 such conferences. Mr. Asad and Mr. Zia have continued this amazing tradition. They have ensured that every Sunday there is a conference and a new poet comes and reads out some poems. This rich tradition still continues. That day was the 236th such conference, and being the conference before Diwali, this was the right time to call Mr. Rampuria to read out Urdu Ramayan. After Mr. Rampuria's recital, Asad Ali Asad also read out Urdu Ramayan with great enthusiasm and Mr. Zia followed. Their devotion, passion and zeal is commendable. They show us how to promote and preserve our rich heritage. Their example must be emulated. I pray to every reader to contribute to the amazing rich trdition and culture of this region and preserve this through our own initiatives. When individuals like Asad, and Zia can join together to preserve and develop the great culture and heritage, there is a ray of hope that our civilisation will be able to survive all efforts to kill it. Lets remember, like on all occasions, the strongest threats to our civilisations come from the people who have assumed the responsibilities of protecting it. Therefore we the common people, have to embrace greater role of promoting our heritage. I would request the reader to organise discussion on Ramayan, or Tulsi Ramcharitmanas, or Urdu Ramayan or Jain Ramayan or other such variants to ensure that there is some discussions on the culture and heritage. Our culture is beyond religions and languages, and at this point we must learn from Asad and Zia how to promote our rich culture and traditions.